Since 1985 Sculpture Workshop Designs has created sterling silver Christmas medallions. Their work has been presented to 4 U. Presidents as well as other noted world leaders. These ornaments are issued in small editions with one, perhaps two designs each year. Each work is titled and dated for the specific year of issue. Each ornament is bas-relief sculpture, similar to the numismatic tradition found in coins and commemorative metals. Each ornament is issued in a high polish finish. A protective coating has been applied to prevent tarnishing. "The Bill of Rights" is sculpted by artist F. Kreitchet commemorating the Bill of Rights. Crafted in lustrous sterling silver, ornaments are issued in a very limited edition of 200. With the limited edition of 200, this ornament is very hard to find. The registration numbers in the edition are hand-engraved on the back of each ornament and then entered into the Sculpture Workshop Designs registry. Each ornament is 3 1/4 round and weighs approximately 1 troy ounce. 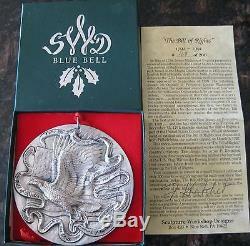 Please check back often as I will add sterling ornaments as time permits. Thank you for your interest. 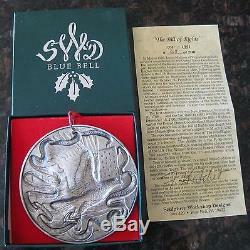 The item "Sculpture Workshop THE BILL OF RIGHTS Sterling Silver Christmas Ornament -1991" is in sale since Monday, June 15, 2015. This item is in the category "Jewelry & Watches\Vintage & Antique Jewelry\Fine\Charms & Charm Bracelets". The seller is "einnon1" and is located in Clayton, California.